Instead of discussing new and upcoming titles which have successful kick-starters, this week I want to use my long post to discuss on older title. 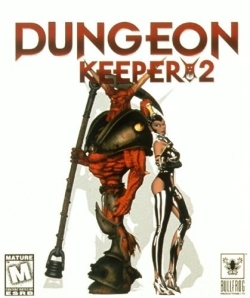 Dungeon Keeper II is an oft overlooked classic of the RTS Genre and one of my all time favorite games. One could imagine a parallel track of RTS designs based on the ideas expressed in DKII. Alas, the world never saw such ideas. Glimpse this alternate reality below the jump! Although released in 1996 the game works fairly well. Most hardware in 2012 can run this game with ease. Ahead of it’s time graphically, it’s definitely behind the times at the moment. You will see graphic glitches during play. Pay them no head, as even a weak laptop should play this game fairly easily. Fear not, for your game will not crash… It just might look a little funky every now and then. The plot is fairly straightforward. Evil is trying to take over the land. The hereos fight the evil. However, the player assumes the role of the Dungeon Keeper, and expands an ever growing dungeon to house an ever growing horde of minions. Use them to crush the hero’s of the land and capture portal gems. What do these gems do? They open portals. Who cares why, the game is fun! Radically different than modern RTS games, the controls will be completely unfamiliar to fans of modern RTS games, but it won’t be a challenge to pick them up (it’s mostly mouse and a couple number keys later on). Many common tropes and conventions of the RTS genre have been turned on their head. There is no human opponent and this is NOT an eSport. A bit more like The Sims, but evil, you really play in a sandbox. Do not expect intense head to head competition. Instead expect to set up your dungeon to your hearts content. The game is rarely that hard, rather, its more of a puzzle to use the resources you have to accomplish the task. In addition to the main quest/storyline the game offers free play modes and some side games. The side games must be unlocked by finding magic items during gameplay. Although I play through the main missions on a yearly basis, the free play modes are pretty interesting as well. You can build your dream dungeon fiddling endlessly with the perfect combos and layouts. Dungeons can be built with peril or without. Using the standard ‘build a building’/’Create a unit’ RTS mechanic, at first gameplay seem’s straightforward. In most RTS games this occurs in a graphic space create to look like the out of doors. This game. however, makes you take chunks of terrain out of the game world, digging underground, to build your space. You then zone certain areas to do certain dungeon tasks. The levels flow very well, and build nicely. New units and rooms are introduced at a good pace, and you will never feel overwhelmed while learning the game, so dive right in. There is a great balance of tanky combat units, ranged units, spell casters, and builder units. You can perfect spells, build traps, or station guard posts as methods to defeat your enemies. Do not expect exact and complete control over your units as you do this. Considering that I have a copy currently installed on my computer, and have been playing this game since 1998, there are few things I can really complain about this game. Perhaps it’s too short. Perhaps it would have been great if the company kept putting out similar titles. Who’s to say? Other people may not like this game at all if they love modern RTS gameplay action. In fact many of the things that I really like about this game may be things other players hate about the game. I would say that the save and load options, as well as main menu (the UI to devs) could use some polish, but they were pretty standard for the time. Watch out for cutscenes! The volume can be drastically different then the gameplay volume. Other than that the audio is actually quite good during gameplay. Units say interesting things, the dungeon heart whispers insanely, and just wait till your first minion wins a jackpot in the casino! Game developers should download and play this game. Which you can acquire from GOG.com. Or hop over to Amazon for a physical copy. It should be ‘required reading’. There are so many tropes and mechanics in this game which are executed brilliantly, but completely different then ‘normal’ RTS games everyone who wants to design games should play this one for inspiration.